After attempting an Oscar campaign for Christopher Nolan's sequel The Dark Knight a few years ago, it looks like Warner Bros. is looking to give Batman some Academy Award love again with the epic conclusion The Dark Knight Rises. The studio has just launched their For Your Consideration site trying to get movies like Magic Mike and more obvious, likely choices like Argo, The Hobbit: An Unexpected Journey and Cloud Atlas some Oscar love. But the push for The Dark Knight Rises is a pretty big deal, since the studio pretty much wants the film nominated for almost every category under the sun. See below! Personally, I really enjoyed The Dark Knight Rises, but I can only see it really getting nominated for technical awards (including Wally Pfister's fantastic cinematography), and maybe an actress nod for Anne Hathaway (though she might have a better chance at Supporting Actress). I'd like to see Nolan get a directing nod, but I don't see it happening in this competitive year. And as for Best Picture, with a potential of ten nominees, the chances are decent. The Dark Knight didn't get that opportunity since only five nominees were allowed in 2008. It's hard to tell whether the sequel would have gotten an Oscar nomination (I'd like to think it would have), but considering this film was inferior to the second installment, I just don't think it's going to happen. Warner Bros. also has superior films with Argo and Cloud Atlas, and most likely the first installment of The Hobbit coming next month. Surely there's plenty of gushing fans who will want to see this film get Oscar accolades (and the Academy might indulge them with a big nomination just to get people to tune in to the live telecast), but there's still a month and a half left with plenty of big Oscar contenders waiting for release. 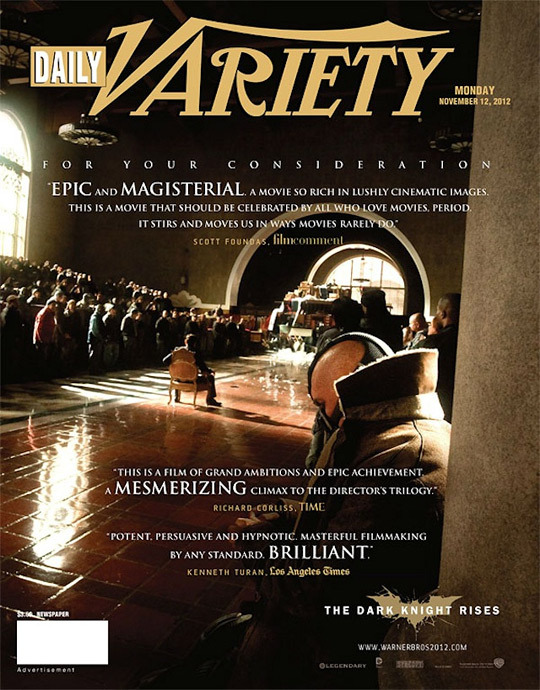 Stay tuned for more as award season heats up, and to see if The Dark Knight Rises gets any Oscar nominations, check back here on January 10th, 2013 for all the nominees. some of those categories i'm not really one to comment on - but as far as the more popular categories, i really don't think this movie deserves an oscar. Don't get me wrong... I love this movie... a lot more than most people. Easily my favorite of the year. But this isn't going to win any Oscars... unless, as the article says, its for a technical category. "And the Oscar for cheesiest reenactment of the fight scene in West Side Story goes to..."
Ya, this movie deserves 16 Oscars. Next they'll tell us that Wrath of the Titans should get 10 Oscars. Not happening. Sorry Warner Bros.
good movie, but for best picture is just ridiculous, sound editing maybe. Loved the movie but some of these... Best supporting actress? Really? Michael Caine has the closest/slightest chance of being nominated imo, but still definitely not enough to win. Other than that, maybe sound. You're right. Michael Caine and Christian Bale were the best from the movie. Michael Caine surpassed his usual great acting and Christian Bale went beyond with his character and topped the notch. The scene where Alfred leaves Wayne Manor is and both of them are shedding tears really hit the spot and is my personal favorite scene in the Nolan Bat-Trilogy. Yeah...to the Oscars AND Warner Bros.....you're both about 4 years too late. The Dark Knight Rises should get some Oscar love in the Oscars this year even if it just wins Oscars in the technical category, at least just getting nominations in the major categories, for best picture and Christopher Nolan for best director would be well deserve. Every movie that has even the slightest chance of getting a nomination does this. I'm not sure why people are so shocked about this. I think it should win just for the sake of the trilogy, I know its not gonna happena dn its mildly stupid but the whole trilogy was an achievement. I had this fantasy, that I would look across the tables and I'd see you there, with a wife and maybe a couple of kids. You wouldn't say anything to me, nor me to you. But we'd both know that you'd made it, and then I'd realize you won an Oscar for this movie, and I'd be like "WTF?!?" Dark Knight Rises was good, but Oscar worthy? Not sure about that. I liked The Dark Knight Rises, in fact I liked it more than Nolan's other two Batman movies, but it shouldn't even be nominated for Best Picture this year, unfortunately. I see Argo and Cloud Atlas getting nominated (I know Argo will, and I have a strong feeling that 5% of the academy will think Cloud Atlas is the best of the year), but not TDKR. Maybe Magic Mike, I'd like that quite a bit. I'm not a big LotR fan, but I can see that getting nominated. Hopefully with your next one, Nolan, you will. I'm surprised they aren't putting that energy into The Hobbit. Will win some technical awards, but nothing more. Meh. I'd really only care about Best Director and Best Original Score. Maybe they'll reward Nolan and Zimmer for their effort on the whole trilogy; that'd be nice. You know, kinda like they suddenly started throwing trophies at Return of the King when the Lord of the Rings trilogy came to a close as if they had to make up for something. The Dark Knight Rises is not a perfect movie and doesn't even come close to The Dark Knight, but Return of the King was by no means better than Fellowship or The Two Towers, imo. So, who knows what'll happen? In the end it doesn't matter to me, personally. Oscars or no Oscars; that won't affect the way I watch these movies. Over and over and over. the fact that people still care about academy awards is telling. if you liked it, that's an award enough. Sorry, to disagree with popular belief but TDKR was in many superior to TDK. It probably won't get the Best pic nomination but I do see it receiving technical and acting achievments.